"Why do you focus on youth?" is a question I get asked from time to time about my work with social entrepreneurs. I was even asked this question by a freshman at UCLA during my recent lecture there on The Green Generation, which showcased countless examples of young people around the world developing their own solutions to sustainability. Perhaps even youth doubt their own abilities to contribute meaningful change? In my response, I tend to mention the creativity, passion and idealism of young people I've worked with. But another reason became more clear in recent days in Buenos Aires, Argentina. I'm here with two students from Claremont McKenna College, Chris Temple and Zach Ingrasci, founders of the project, Living on One Dollar. They were nominated by Ashoka to speak at TEDxBuenosAires, the largest TEDx event in the world. 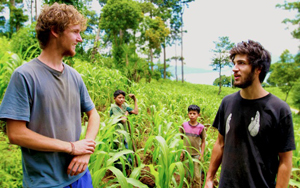 In front of 1,300 people, Chris and Zach -- the youngest speakers -- told of how they spent two months in 2010 living in Guatemala on a dollar a day and researched the financial lives of the extreme poor. They brought along two other friends, Sean Leonard and Ryan Christoffersen to document the experience and create weekly videos to distribute through their website and YouTube channel. They hoped that their own experience of living among the extreme poor and under similar conditions could bring the issue of global poverty closer to their peers -- other American youth. The gamble paid off. Their first video caught the attention of YouTube and was featured on its homepage, resulting in more than 400,000 views in one day. Since coming back, they've been focused on putting together their documentary (and going to school). TEDxBuenosAires marks the first time they are presenting their full story as well as their two month research to a public audience. As an advisor to their project, I came along to help them prepare their talk. Our hope was that it can be told well (and we'd get a good recording of it) and that their story doesn't get eclipsed by the Argentinean speakers. Little did we expect the media frenzy that was to follow. Argentina's main national newspaper, Clarin, published a lengthy feature on their project the morning of the event. After the talk, they were immediately surrounded by reporters wanting to interview them for radio, TV, and webcasts. Chris and Zach fielded each interview, sometimes live and sometimes in Spanish, until they became mentally exhausted. That night, we channel surfed in order to catch their various TV appearances. Watching everything unfold, my one thought was, "Why them?" Why did no other speakers get the kind of coverage they did? Were they more famous or accomplished? Was it because they were American? Perhaps it's because their talk was inspiring but some reporters interviewed them without having even seen their talk. I think, in the end, it had to do with the simplicity and unexpectedness of their project. One brief summary - "American students living on one dollar a day in Guatemala" - and you are promised a good story. We know the term for this in Hollywood: high-concept. As much as we want to focus on character, dialogue and storyline, high-concept sells. It gets you funding as well as coverage. Like it or not, the masses are engaged with "What if..." scenarios. I think the social sector can benefit from more high-concept projects and campaigns, instead of simply relying on the worthiness of causes. If Living on One Dollar can engage the masses to think about global poverty, imagine what can be done with climate change or any of the other Millennium Development Goals, a term few outside the social sector can get excited about. Imagine rescuing "sustainability" from the meaningless abstraction it has become. Someone has to go experience something interesting. You can't just bring back knowledge and insights. You have to take part in some drama. The experience can't be predictable. It has to go beyond what is normally considered to be safe or sensible. Failure should be possible, even likely. As Chris said, "The plan wasn't perfect, but we didn't want perfection to stand in the way of action." You have to take us there, especially through video. You have to help us live through the experience with you (as much as you can). For all these reasons, I believe youth are more likely than other groups to bring high-concept stories to our most critical challenges. Today's youth are naturally high-concept. Look at what Invisible Children did for the civil war in Uganda. Look at what Darius Goes West did for Duchenne muscular dystrophy, a condition few had heard of before. Of course, the real promise of good stories is that they can deliver meanginful impact and change lives. Chris and Zach want to use their film to support other young social entrepreneurs, tell their stories and spread their solutions to poverty. Perhaps you can help them find that perfect ending.